18. 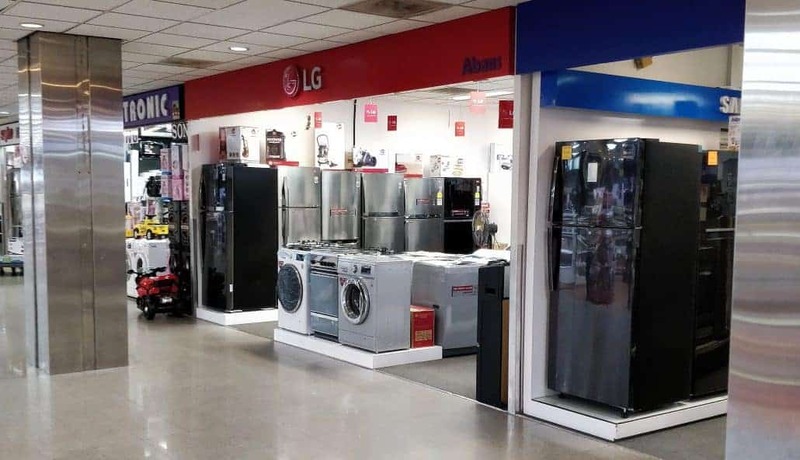 Need a new fridge when you arrive? 20. Hearing ice cream vans in the street? 21. It’s a dog life! When someone in Sri Lanka shakes his head from left to right it doesn’t mean he’s not agreeing with you. The same gesture we see as no, means they’re okay with your thoughts. it’s a little wiggle they do, not really left to right. Most people in Sri Lanka are Buddhistic, hence they see cows as sacred. 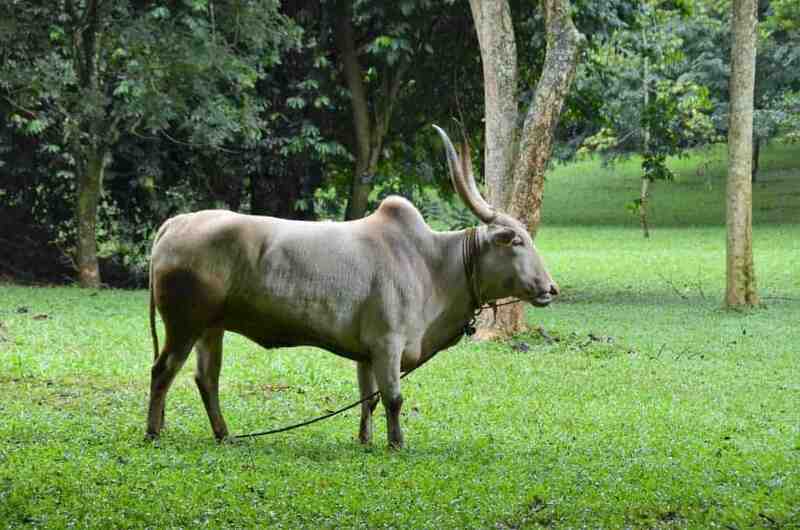 So sacred that some Sri Lankans keep a cow in their front garden and walk with the animal a few times a day! 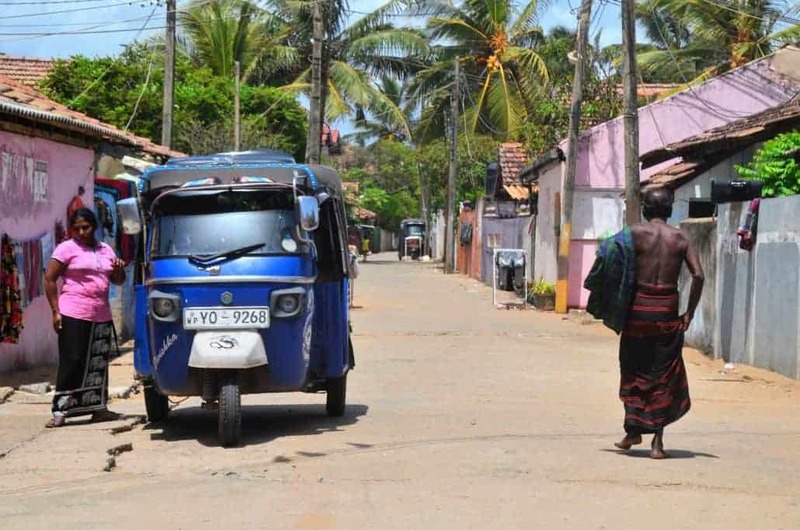 We haven’t been in the north, but they told us that in the northern part of Sri Lanka there are more cows than cars. One of the nicknames of Sri Lanka is ‘nation of smiling people’. Says enough, doesn’t it? At least 9 out of 10 people you see on the street will show you their white teeth, surrounded by a big smile! Honking whilst doing so too. They literally honk every time they pass a bike, motorcycle, tuk-tuk or car and that’s at least six times every minute. Up until 1972, Sri Lanka was called Ceylon. That’s why you’ll see the word Ceylon all over Sri Lanka. Some Sri Lankans still call themselves Ceylonese. As much as Sri Lanka is one united country, it’s also divided into different ethnic groups. The 2 largest groups are the Sinhala and Tamil. Sinhala is the largest group, most of them living in the southern part of the country (74.90% of the population in 2011). Tamil 11.15%, closely followed by the Sri Lankan Moors (9.30%). 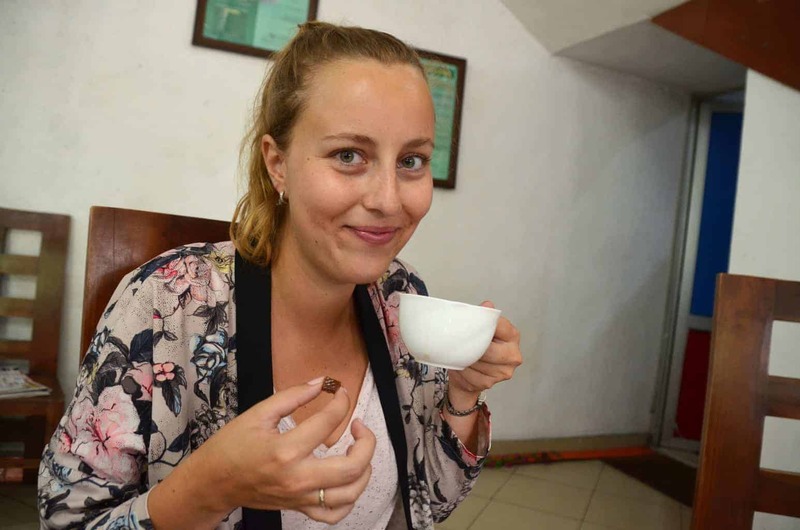 Sri Lankans will have tea for breakfast, lunch and dinner. They’re the 2nd largest producer of tea in the world. Did we mention the amazing train ride between Kandy & Ella where you’ll pass astonishing tea plantations? Year on year, the literacy rate among each gender here is always over 90%. You’ll also notice that all kids try to talk to you in English to ‘train their English’, however, the little toddlers mostly only know hello & goodbye. And some of them add an unpleasant “money?”. It’s not because you see ‘hotel’ on a building that it actually is a hotel. A lot of times it is a supermarket or a restaurant. 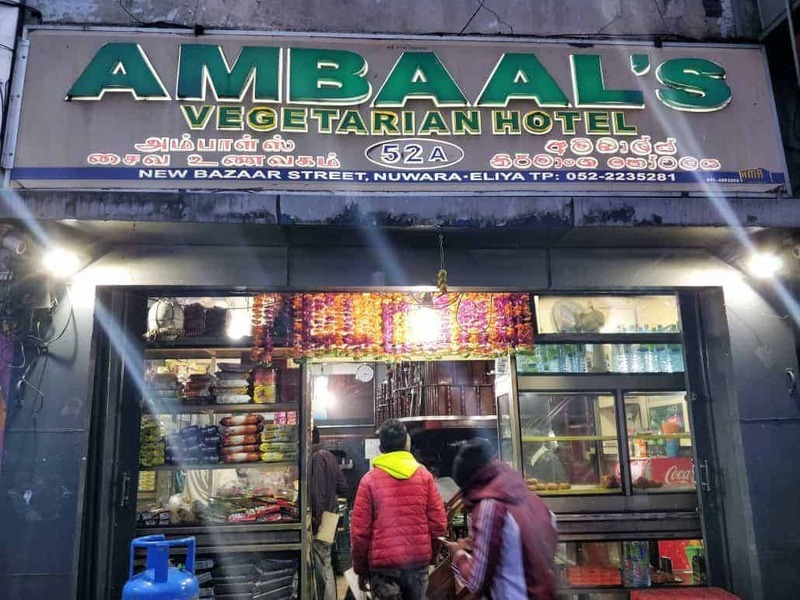 Our favourite ‘hotel’ was Ambaal’s, the vegetarian hotel, where they had delicious food, but not a single bed! There are guesthouses all around Sri Lanka. It’s our preferred way of travelling as we really meet the locals. You’re staying in their house and sometimes eat with them. You’ll have a clean and private room, and it’s not another hotel or hostel chain. Another advantage is that you have the wifi all by yourself (and the locals) so you won’t be bothered by other kids eating up all of the data with their youtube videos. We don’t like going to touristic places as they’ll just serve you a pizza or whatever food from home you want and you’ll have to pay even more than you would at home. We prefer tasting the real local life. Not only teaches it you a lot about their food culture, it’s also a lot cheaper (and most of the time more delicious). Same goes for transport. Don’t take a taxi everywhere. Live at the pace of the locals. 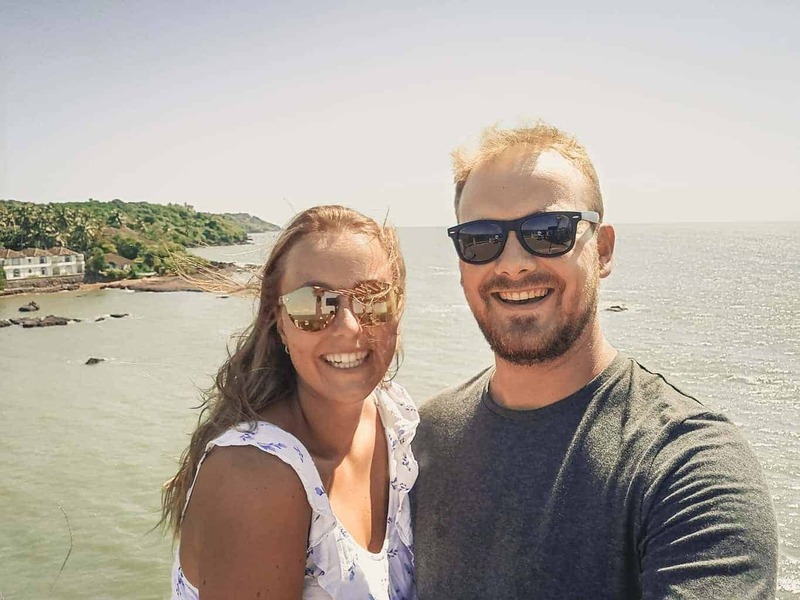 Use their forms of transportation: a tuk-tuk, a bus, a train,… not only is it an incredible experience, but it’s also once again way cheaper. We paid 1-3€/$ for every bus we took. Some of the bus rides were more than 4 hours! Tuk-tuks are amazing vehicles (we want one in Belgium when we go back!). The only two disadvantages are the crazy drivers and the negotiation for the price. As a rule of thumb, the drivers will ask double the price. So if they ask 1000, you should say half of that price: 500. If you stick to that price you’ll end up somewhere around 600 which would be a fair price. 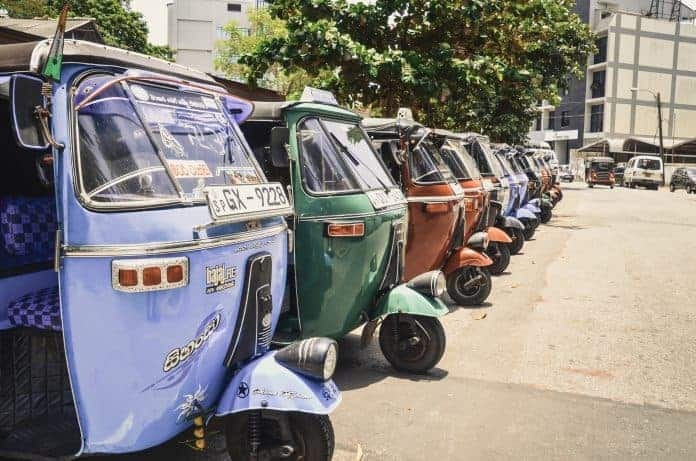 If you have a local sim card you can use the app ‘Pick Me Sri Lanka’ which has been of great use to us as you can book a tuk-tuk through the app or just use it for reference prices. But probably not. You won’t have much of a personal bubble if you’re standing or sitting on a bus or train. Not knowing if I am the one who smells or my neighbour. The government of Sri Lanka has announced a buffer zone around every national park of 2 kilometres a couple years ago to preserve the nature! Not only does this forbid new buildings, it also makes it possible for animals to roam around the parks so you can meet them on the streets. Some blogs state that you cannot visit the northern provinces without some kind of approval letter (like a mini visa). But every local we asked about it, said that you can easily visit the northern provinces. Just like American dollars, the Sri Lankan rupees should all be of the same size. But when you compare the bills closely, you’ll see that they’re not all the same. The reason: different banks have made the money in the past and they all had different machines. So don’t worry if your 2 rupee bills with the same value are not identical. The first time we heard the ice cream sound on the street we were like “ooooh ice cream”. When we arrived we saw a tuk-tuk driver selling bread. Jup, whenever you hear the ice cream sound it’ll be a local trying to sell bread, samosa and other delicious food. But no ice cream. 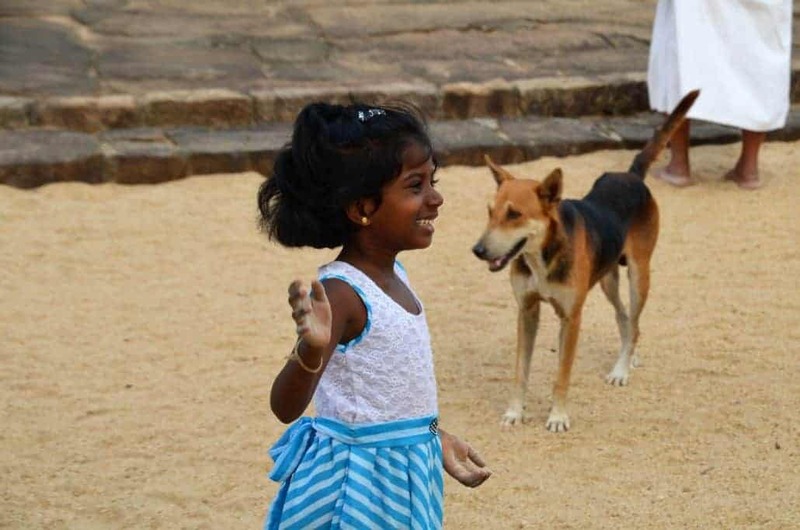 There are stray dogs everywhere in Sri Lanka. Literally everywhere. Other wild animals you’ll see a lot: cats, crows and monkeys. Watch out for the latter, they seem cute, but they’re real thieves. Fishing is not only one of the main income streams for a lot of Sri Lankans. Sri Lankans are also a bit superstitious when it comes to fish. 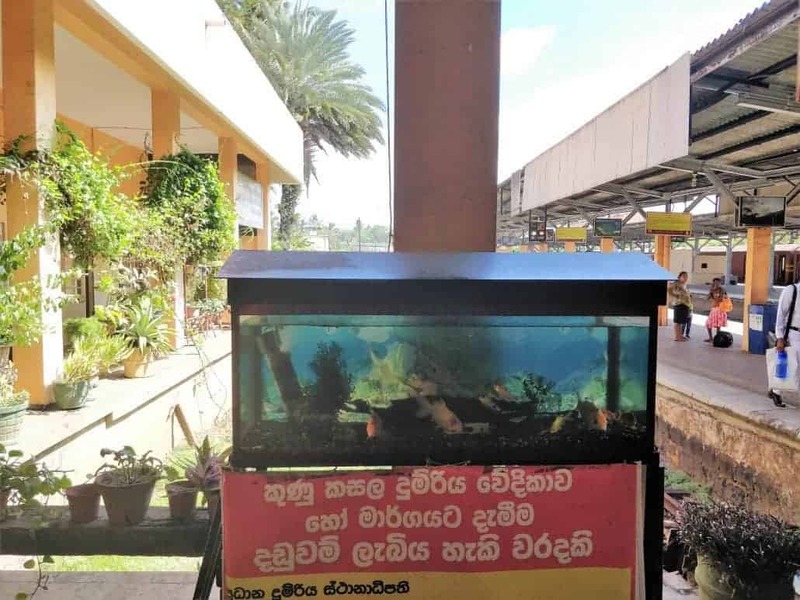 In every railway station, there is a tank with fish inside, which guarantees safe travels. Sri Lankans love breakfast. They have many possibilities like hoppers (Coconut milk, hardened in some kind of a bowl so they end up like bowls and are eaten like pancakes. They top them off with onions, tomato and spices), string hoppers (almost the same, but small pieces with dip sauces), pancakes, but also rice with curry. Another type of food they love is pastry. 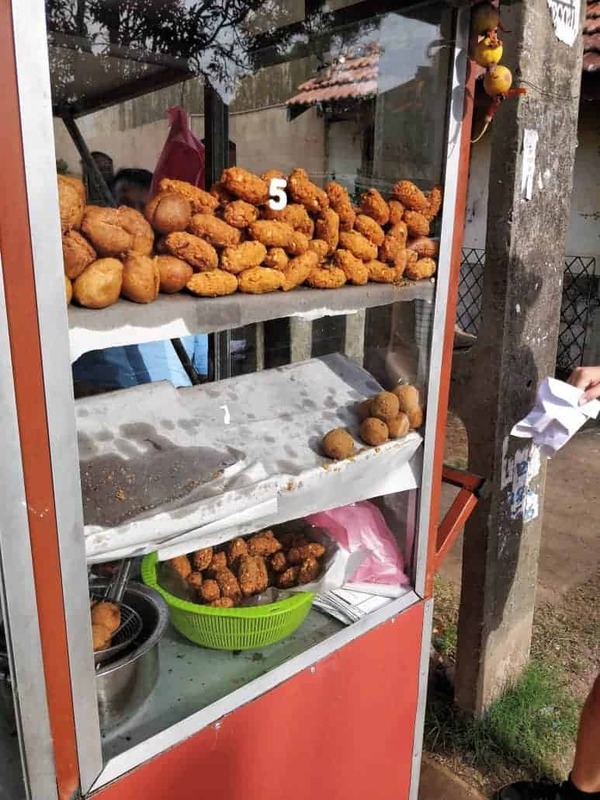 Some of our favourites are wade (fried vegetables in the shape of a cookie, sometimes with prawns or dale), samosa (spicy triangle) and roti (a wrap with different fillings: egg, vegetables, chicken,…). Remember number 20? Jup, that guy sells them all! 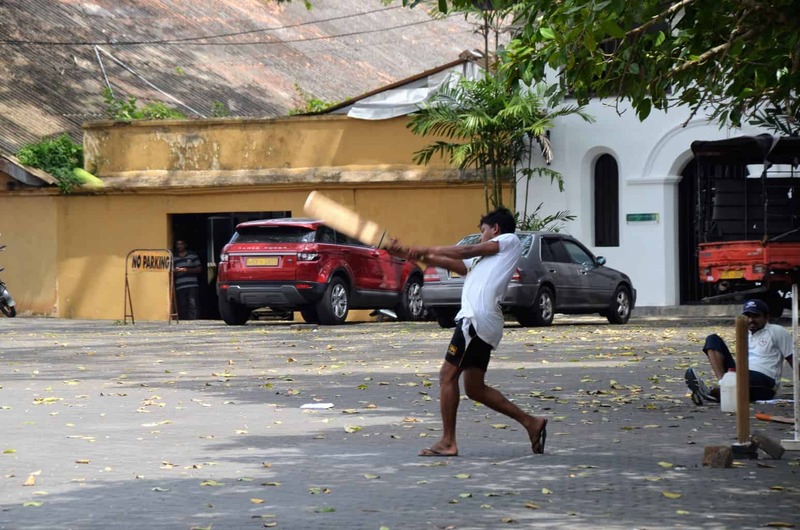 The national sports in Sri Lanka are cricket and volleyball. We haven’t seen anyone play volleyball, but we’ve seen lots of cricket! 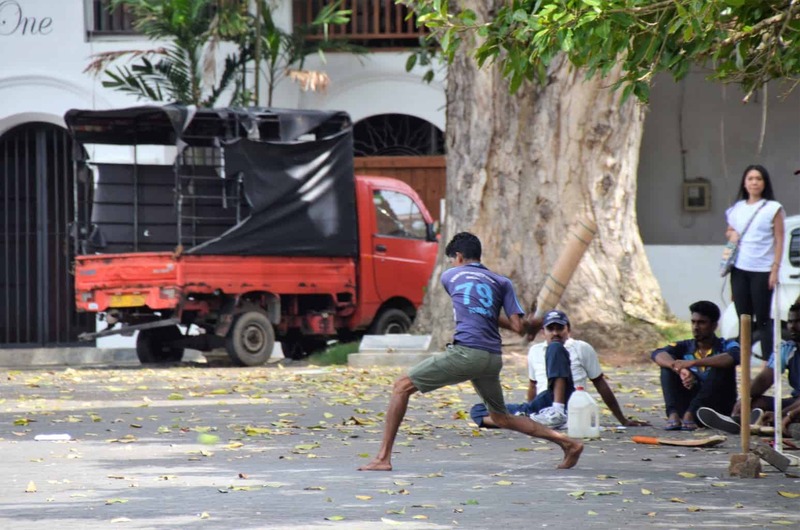 We’ve only seen one official match, but when kids are playing around about half of them are practising their cricket skills. 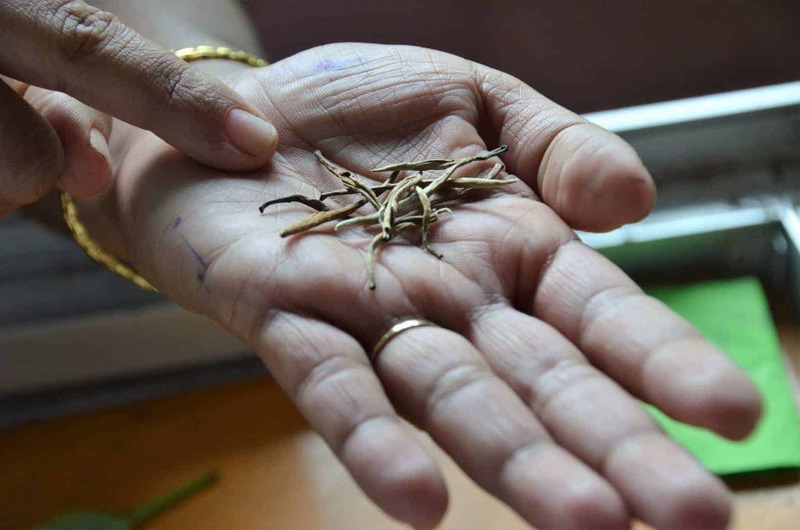 Sri Lanka is famous for their spices. Cinnamon? About 80% of all cinnamon comes from Sri Lanka. ‘The lion flag’ is considered one of the oldest flags in the world! It also has a unique design, it’s the only flag in the world to recognize different religious groups. As you could read in 6, there are lots of ethnic groups. In the flag, the Buddhists are symbolized by the yellow border and the Bo Leaves (peepal tree). The green represents the Muslims and the saffron represents the Hindu communities.